If I heard right yesterday was the hottest day of the year so far yet today actually feels cold in doors! 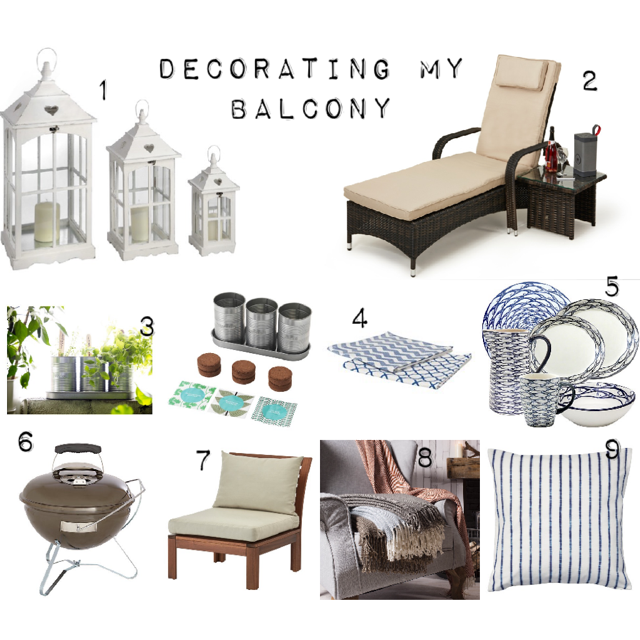 When the sun comes out I'am always thinking of how to decorate our balcony. We have a fairly large balcony so during the summer periods I spend quite a lot of time outside, we have amazing view of the sea so it's a beautiful view. Our balcony is fairly large square shape and it's covered so we don't have to worry about our furniture getting wet when it rains / snows which is handy. I usually leave cushions out all year round and they don't seem to get damp either. I spend a lot of time lazing around reading / having breakfast or lunch / watching stuff on my ipad in the evenings / BBQ and we even have shisha with friends at the weekend. Our lounge isn't large and the balcony leads on from the lounge so it's extended space for entertaining. Right now our balcony is rather bare with a few pieces of furniture and I would like to do it up properly with all the plants / soft furnishings making it very homely etc... I am really loving the blue / white colour theme for the furnishings and keeping to the wooden furniture along with adding some greenery. So what do you think?